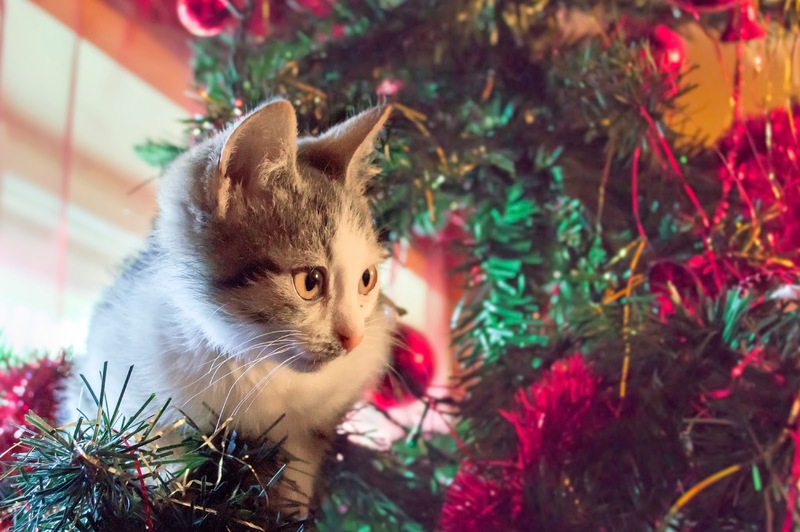 Are your holiday decorations cat-proof? Sparkling decorations can attract your pets attention. Here are a few tips to help you keep your Christmas tree in tact through the holidays. Create a Cat Tree – Make your cat a tree of his or her own! Make sure that it’s is secured down with twine to prevent it from toppling. Use cat-friendly decorations like catnip mice, kitty treats or soft cat toys. Avoid Fertilizer – If you have a live tree, don’t add fertilizer or preservatives to the water at your tree base. If your pet drinks this water, they could get sick! Add Citrus Scents – Scents like orange or lemon are off-putting to cats. Vicks menthol is also a good repellent that will keep your pet away from the tree. Use Double-Sided Tape – Certain cat training products like Sticky Paws are available in large sheets and strips. You can apply this tape to your carpet beneath the tree to keep your pet out of danger. Check out this article for more tips on how to keep your pets safe through the holidays. As always, if you have any questions about how to care for your pets, contact our office. Our veterinarians are happy to help you with all of your pet’s health needs. Visit our blog again for more pet care tips!